Gospel's story-telling tradition goes back to the Good Book. Tell us to have faith, and we may nod in agreement; tell us the story of Jonah and the whale, and we see and feel. We hear that tradition in street preachers like Reverend Gary Davis, in voices from the golden age of gospel -- Mahalia Jackson, RH Harris, Dorothy Love Coats -- and in Dave Bass. Bass has paid particular attention to the tender, intimate style of Sam Cooke -- the style that makes "Touch the Hem of His Garment" seem like a story from just down the block. As Bass says here, "old school or new school." When he sings, "I don't have to touch your body to know they pierced you in the side," he puts you there: in a story as old as faith. 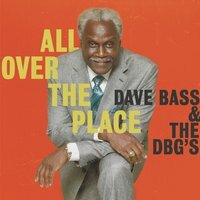 Dave Bass new Release...."All Over The Place"
A very impressive CD of classic Gospel. quartet singing. All songs have deep Christian meaning. I like all the songs on the CD, but especially l"We Made it Through," Which covers the Black experience from slavery to now. and "Remember the Vets." One can hear a tint of Sam Cooke influence, in his voice, but he is not trying to be another Sam Cooke. Wish there were more songs, but I am very satisfied with this collection. Excellent song writing, and excellent singing. Well worth purchasing..